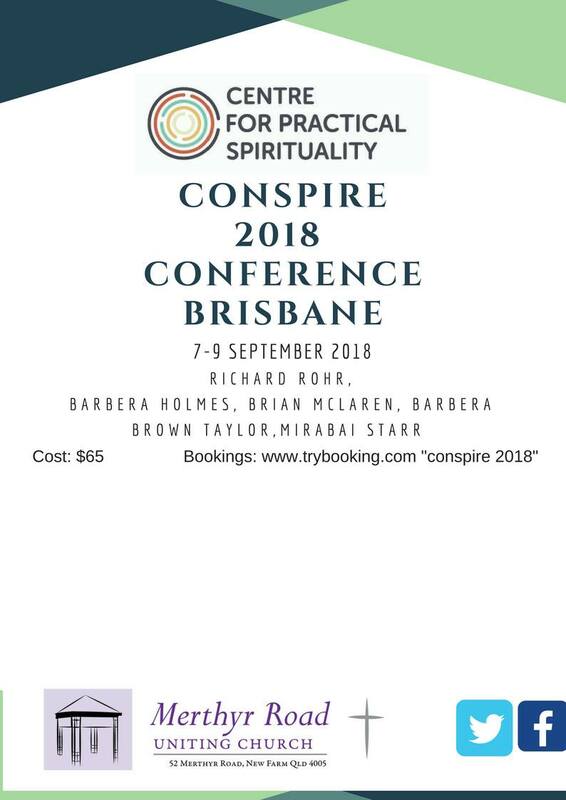 The Centre for Practical Spirituality, in conjunction with the Centre for Men and Families, is hosting the Conspire 2018 conference, via video link, in Brisbane, from Friday 7 September to Sunday 9 September. The venue is Merthyr Road Uniting Church, 52 Merthyr Road New Farm. Presenters include Richard Rohr, Barbera Holmes, Brian McLaren, Barbara Brown Taylor and Mirabai Starr. They will also lead times of meditation and workshops. This Brisbane conference will adapt the primary conference being hosted by the Center for Action and Contemplation in Albuquerque, New Mexico USA, so that attendees in Brisbane will experience the teaching, meditations, discussions and community building activities of the USA event. This conference will offer a space for spiritual growth and deep transformation. For more information, click here. Tickets are limited. Cost is $65 and includes a light dinner on Friday night and morning and afternoon teas on the weekend. Register by going to www.trybooking.com using this link. Richard is the CEO of the Centre for Men, has a background as a pastor and spent many years in the corporate sector. He has a masters in counselling and a diploma in ministry, and has a heart to champion men, women, marriages and families. Richard is married to his wife Judy and has three sons.